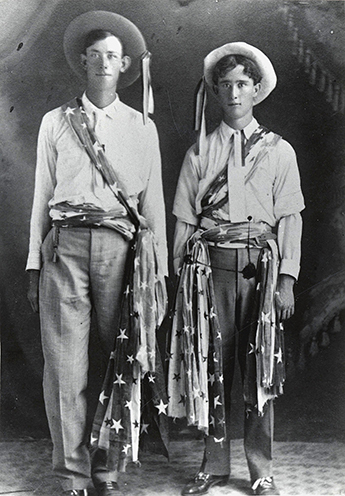 Tempean’s Merton W. Stewart (left) and Rex Anderson (right) are dressed in patriotic bunting for possibly for the Fourth of July in this late 19th century undated photo. Ever since 1777 a year after the Declaration of Independence was ratified by the Continental Congress the Fourth of July has been celebrated all across America. In fact the Fourth of July celebration at Beach Park with the SRP spectacular Fireworks Show has become the Valley’s most popular holiday event. It is built on a long tradition. That declaration wasn’t made in regard to this year’s festivities. It was the words of an effusive town booster writing in the Fourth of July program in 1888! Following the event, the Tempe Daily News reported on July 7, 1888, the “…Fourth of July was a grand and most glorious success. The elaborate and attractive programme caught the multitude, for never before has the Salt River Valley witnessed such a concourse of people assembled together to participate and enjoy the celebration of our national independence. “Everything had a galaday experience, everybody (had) on their holiday attire, houses were bedecked and covered with emblems of freedom … and nothing seemed to stand in the way of its complete success. “Even old Sol, who seems to hold such proverbial spite against this particular day, arose propitiously and hardly had he proclaimed a beautiful day when people from every corner of the valley came pouring in by the hundreds, in carriages, wagons, on horseback and foot …(becoming) so vast that people stood in amazement and wondered where all the people came from. “Everybody seemed full of patriotism and bent on getting all possible enjoyment out of the festivities of the day. At I:00pm after the customary speechmaking, patriotic songs and a “juicy” barbecue there ensued what was probably the most bizarre Fourth of July “entertainment” in Tempe history. “The warahoop was heard and the grand sham battle between the Pimas and the Apaches commenced ─ …(a) novel scene…watched with intense interest by most of the spectators as something they had never seen before and probably never would again. “About 100 or more Pima on horseback charged up the butte at full speed to avail the band of warriors impersonating the Apache who were secreted among the rocks. “The battle then became general and almost realistic, the Indians fighting in their true characteristic style. “Charge after charge was made and repulsed by the contending parties until the ‘Apaches’ who were greatly outnumbered were dislodged when a hand to hand combat took place ─ the wiry Apache often dismounting the foe. “The fight still continued on foot and after a desperate struggle the wilt ‘Apache’ was conquered.